Browsed. Cooked. Clicked. Posted - thus came about this totally delicious Lucknowi biryani. I had already scheduled a post for alphabet L but wasn’t happy about the post - something kept nagging , I can’t really put my finger on it. So just yesterday late evening at home after work, was leisurely browsing and one thing led to another and I landed on this yummy biryani recipe from Smitha's blog. Having been to that city a couple of times, I have noticed that biryanis n kebabs complete the street food picture :) of course as mentioned in my Galouti kebab, most dishes are meat based which are now getting popular being converted to veg/vegan versions. This is a pure veg biryani. Of course the original recipe included ghee which I have completely omitted without any lack of taste. As am posting this on the day of the post and not before, there’s a linkback to the original recipe as I followed it 100% except to omit ghee and top it with fried onions and dried rose petals. Thank you, Smita ! We loved the simple, earthy flavours and the proportions were exact. This can be vegan if you sub the milk and the yoghurt with vegan substitutes. So am simply linking it back to the original, where you may find all ingredients n methods. Of course the picture tutorial will do full justice to the steps . Serves : 3~4 generously with 2 cups of cooked basmati rice + 1 cup of cooked vegetable. Ultimate veg briyani, cant ask anything more.Can smell the flavor of this dish rite from my lappy screen. And those prefectly cooked rice grains are simply fabulous. A Biryani without ghee is interesting , though I love the aroma of ghee in it . Browsing , cooking , clicking and posting in the same day is truly awesome , something I can never do ! Kudos ! For all the efforts , the Biryani looks fantastic ! I love making and eating biryani. This Lucknowi version looks and sounds so flavorful, spicy and delicious. Would love to try it out some time. Biryani without ghee, sounds interesting !!! 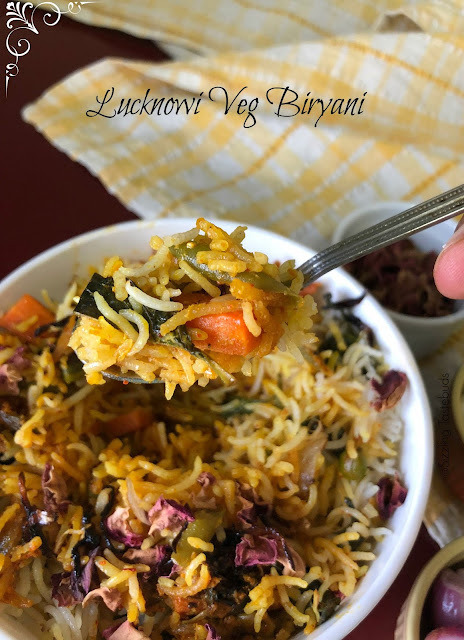 Lucknowi Biryani looks awesome and you have made it so well. Great job, Kalyani. You looked up, planned and executed in the evening? Hats off. The biryani sounds really flavorful with all those spices. That biryani is awesome Kalyani. Looks so colourful, spicy and delicious..
Beautiful and im a great fan of biriyani ,,it is just perfect for me!! 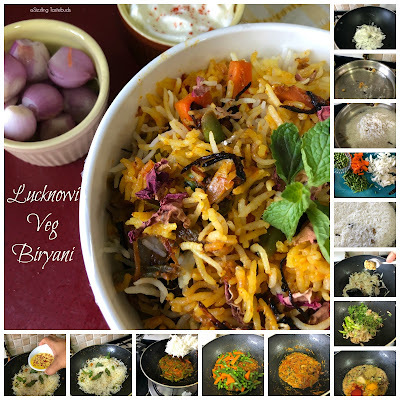 Omg excellent veg biryani lucknowi style :) looks so inviting kalyani, perfectly cooked long grains .. Biryani without ghee, I would not mind the skip as it looks so fantastic !! 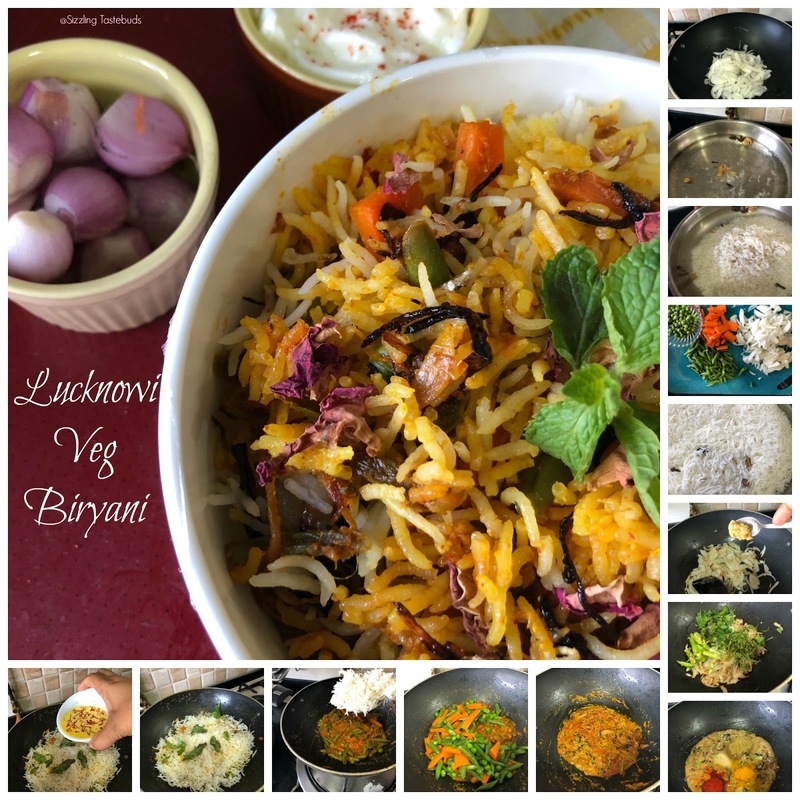 such an flavorful biryani , he he I know it takes lot of effort you research , cook, click and post on the same day , as I did for most of my day's last week !! kudos for the efforts !! The biryani looks awesome kalyani, will surely look up the recipe and make it sometime! 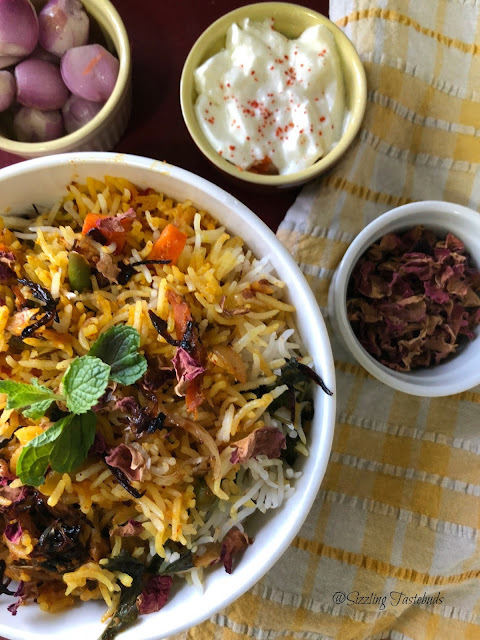 The biryani looks very inviting and I just love the subtle flavor the rose petals add to it. I love adding ghee to biryanis, as I feel that's what makes it so special. I wonder how to managed to browse, cook, click and post the same day! Super job Kalyani! The briyani looks very inviting and I am booking this. My EO will surely love this one. I love biriyani as a weekend meal with some raita on the side. This version sounds very flavorful and definitely something we would love. The fried onions on top would be my boys favorite. The biryani looks amazing with those layers and bookmarked this too. :)) Just by the pictures, I am guessing this tasted fabulous. Biryanis always makes me hungry, looks so colorful and tasty.